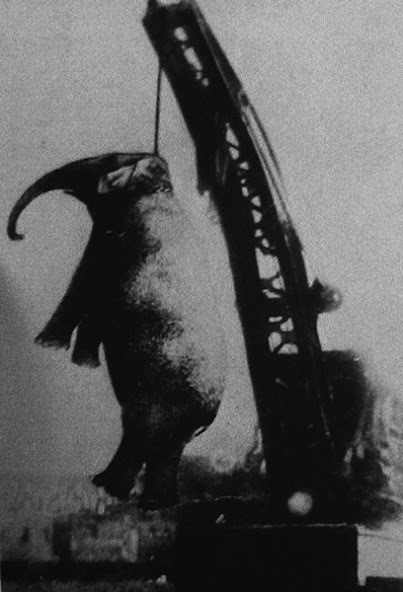 On September 13, 1916 a five-ton circus elephant was executed, hung from a 100-ton Clinchfield railroad crane car, in the little town of Erwin, Tennessee. ‘Murderous Mary’ had killed a man, and for that she had to die. Shooting her in the four soft spots on her head would be both difficult and dangerous. She wouldn’t eat poison. And the town didn’t have enough power to electrocute her. The circus owner knew they would have to put Mary down. He decided to use a railroad crane used for unloading lumber cars. Over 2,500 people turned out to watch the execution. They let Mary hang for 30 minutes, then lowered her into a grave dug with a steam shovel.